Not since Marx identified the manufacturing plants of Manchester as the blueprint for the new capitalist society has there been a deeper transformation of the fundamentals of our social life. As capitalism faces a series of structural crises, a new social, political and economic dynamic is emerging: peer-to-peer. 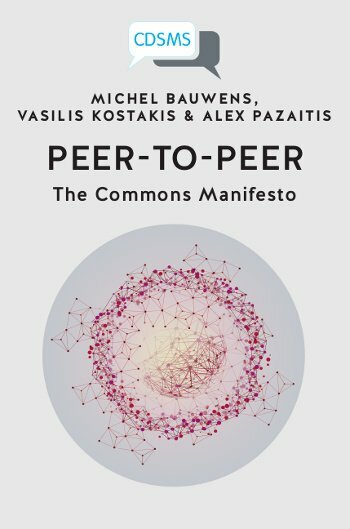 This book asks what is peer-to-peer (P2P)? Why is it so important to building a commons-centric future? And how could this happen? Using a political economy framework this book discusses various cases exemplifying P2P commons-orientated value models. This book aims to critically intervene through proposals for a commons transition strategy. In this way it illustrates how state, market and civil society can build more inclusive and sustainable institutions. I think I read that it will be available for free download on release. I was searching around and found what may be an early draft or precursor to the book if you're interested.